This documentary film was premiered worldwide on Thursday 20th September 2012. Project World Peace presented a global première from 7-8 pm at The LifeCare Centre, 2 Cheyne Street, Stockbridge, Edinburgh EH4 1JB. Entry to the public was free. "Freedom for Birth" will highlight the human rights abuses happening right now in North America, Europe, Australia and beyond. And, the film will offer up a solution that can help protect womens' rights. Project World Peace was one of over one thousand organisations and people premiering 'Freedom for Birth' worldwide in 51 countries in 17 languages. Trailers are available here (3m12s) and here (10m17s) and are embedded below. 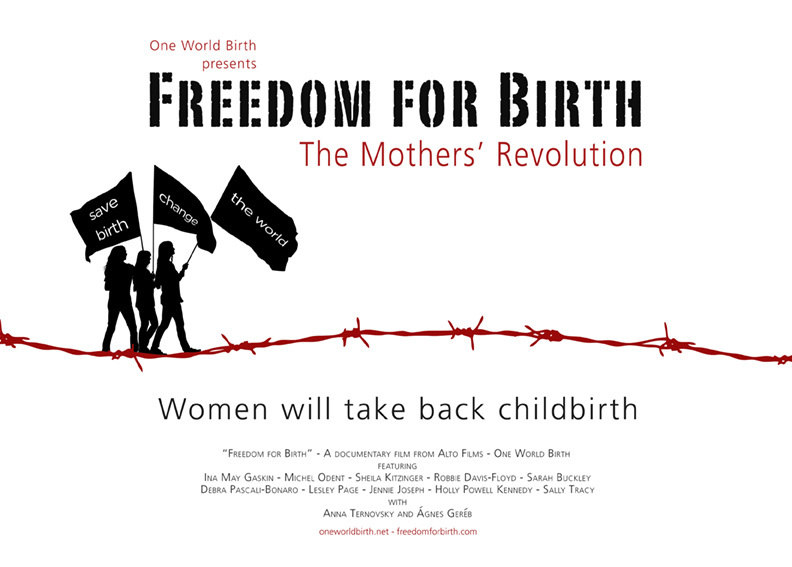 Freedom for Birth - The Mother's Revolution is a 58 minute documentary film from Alto Films for One World Birth produced and directed by Toni Harman and Alex Wakeford. The documentary film features: Ina May Gaskin, Michel Odent, Sheila Kitzinger, Robbie Davis-Floyd, Sarah Buckley, Debra Pascali-Bonaro, Lesley Page, Jennie Joseph, Holly Powell Kennedy, Sally Tracy with Anna Ternovsky and Ágnes Geréb. Bulleted points above are from the Freedom for Birth website (accessed 17th September 2012). "The freedom in a country can be measured by the freedom of birth."